Sadly, many otherwise well-meaning Christians, Pastors, and Teachers have fallen for the lie of easy-believism, decisional evangelism, and so on. Essentially, their theology says all a sinner needs to do is invite Jesus into their heart and believe. Believe what, exactly? You must understand, a smattering of Gospel verses followed by a prayer will save no one, as I will attempt to illustrate below. This a misrepresentation of what THE TRUE GOSPEL is all about, and is a lie from hell. So, what dies this prayer look like? Although there are many variations, the typical prayer goes something like this – “I confess to God that I am a sinner. I believe that the Lord Jesus Christ died for my sins in the cross and was raised back to life so that I could be made right with God. I now repent of my sins and receive and confess Him as my Saviour and Lord”. John 15:5-6 – “I am the vine, ye are the branches: he that abideth in me, and I in him, the same bringeth forth much fruit: for without me ye can do nothing. If a man abide not in me, he is cast forth as a branch, and is withered; and men gather them, and cast them into the fire, and they are burned.” Scripture says we do not invite Jesus into our heart; He comes to us when we love Him. How can a sinner receive Jesus without first loving Him? The NLT translates v12-13 as “But to all who believed him and accepted him, he gave the right to become children of God. They are reborn – not with a physical birth resulting from human passion or plan, but a birth that comes from God.” John is writing to make clear the spiritual birth of the converted is solely and singularly a work of God, and not of ourselves. Therefore, I must conclude the sinners prayer makes salvation a work of man, robbing Christ of His redemptive role saving sinners. Ephesians 2:8-9 – “For by grace are ye saved through faith; and that not of yourselves: it is a gift of God: Not of works, lest any man should boast.” We are saved by grace and not through a sinners prayer confession, the spiritually dead cannot make themselves undead. Ephesians 2:1 – “And you hath he quickened, who were dead in trespasses and sins”. I agree, yes, this prayer includes certain elements of the Gospel, however it does not represent THE Gospel, nor adequately convey the message of salvation. The impression is we are saved by praying a prayer, which of course is untrue; salvation is by faith alone. Regardless of form, the sinners prayer is NOT the Gospel, and will result in a false conversion. Based upon the verses presented, does a person reading only these two pages have a solid of understanding of the Gospel? I would have to say, no. The true Gospel may be likened to a lock which may only be opened when using a specific key; any changes to which will render it useless and the lock remains closed. The Gospel is very specific and cannot, must NOT, ever, ever, be changed or altered in any way. A careful search of the Scriptures leads one to conclude the core essentials of the Gospel include. Romans 10:8-17 – “But what saith it? The word is nigh thee, even in thy mouth, and in thy heart: that is, the word of faith, which we preach; That if thou shalt confess with thy mouth the Lord Jesus, and shalt believe in thine heart that God hath raised him from the dead, thou shalt be saved. For with the heart man believeth unto righteousness; and with the mouth confession is made unto salvation. For the scripture saith, Whosoever believeth on him shall not be ashamed. For there is no difference between the Jew and the Greek: for the same Lord over all is rich unto all that call upon him. For whosoever shall call upon the Lord shall be saved. James 1:17-20 – “Even so faith, if it hath not works, is dead, being alone. Yea, a man may say, Thou hast faith, and I have works, and I will show thee my faith by my works. Thou believest that there is one God; thou doest well: the devils also believe, and tremble. But wilt thou know, O vain man, that faith without works is dead? *The following narrative is a summary of the presentation method taught during an evangelism course at our church, a few years ago. While certainly not the only presentation method of evangelism, it does provide a logical and thorough presentation of the Gospel, and a blueprint to lead a lost soul to Jesus. I have included it here for comparison against the “Sinners Prayer”, or “Decisional Evangelism” method. You must never ever have sinned, not even one time! God’s laws are essentially summarized in the “Ten Commandments”; Thou shalt not murder, Thou shalt not lie, and so on. The two most important characteristics about God we must understand in order to comprehend the gospel, are that God is both loving and just at the same time. In order for us to be saved by our own “goodness” and abilities, it is necessary for us never to have sinned. God’s perfect justice demands and requires sin to be punished. God loves each human being to the ultimate, maximum possible extent, so much so, the human mind is incapable of fully comprehending His love for us. Jeremiah 31:3 – “The LORD hath appeared of old unto me, saying, Yea, I have loved thee with an everlasting love: therefore with lovingkindness have I drawn thee”. Ephesians 2:4 – “But God, who is rich in mercy, for his great love wherewith he loved us,…”1 John 4:8 – “He that loveth not knoweth not God; for God is love.” The love God has for us is so intense and powerful, He is compelled to forgive us of our sins. However, we also know that God is perfectly just and must see our sin punished. Plan C: God will search the Earth for a single righteous man to take the punishment for sin for all mankind. Psalm 53:2-3 – “God looked down from heaven upon the children of men, to see if there were any that did understand, that did seek God. 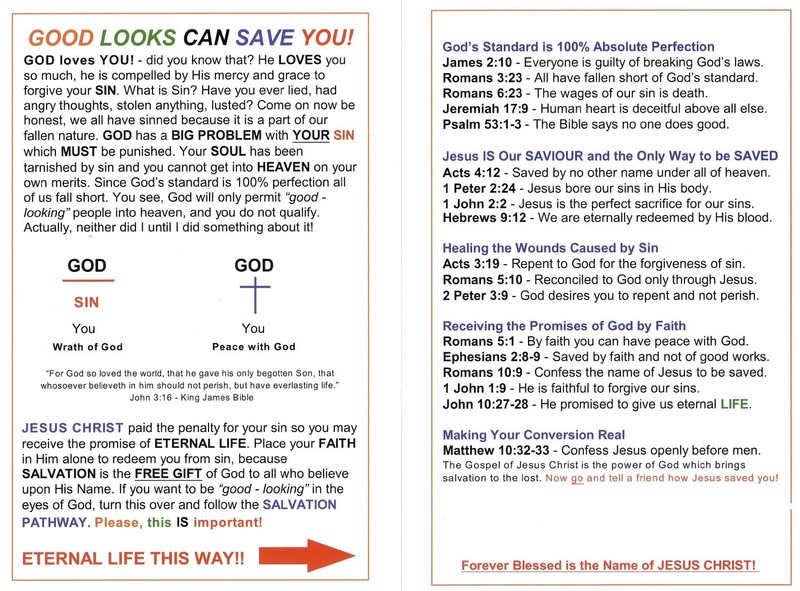 Every one of them is gone back:they are altogether become filthy; there is none that doeth good, no, not one.” Isaiah 53:6 – “All we like sheep have gone astray; we have turned every one to his own way…” Romans 3:23 – “All have sinned, come short of the glory of God.” Plan C dies on the table since scripture makes it plain no human being is without sin. Plan A: This is THE PLAN God established from the foundation of the world as the only way to forgive mankind, while at the same time satisfy His judgement against sin. A miraculous conception, Luke 1:26-35 – “And in the sixth month the angel Gabriel was sent from God unto a city of Galilee, named Nazareth, To a virgin espoused to a man whose name was Joseph, of the house of David; and the virgin’s name was Mary. And the angel came in unto here, and said, Hail, thou that art highly favoured, the Lord is with thee: blessed art thou among women. What we have just learned would appear to say that every person is automatically saved, however this is not exactly the case. Consider the following illustration. You and your family have planned a spectacular holiday at an exotic tropical resort. Finally, after months of planning and waiting the big day finally arrives. After checking in at the airport and clearing customs, the call for passengers to begin boarding is announced over the speaker system. Everyone heads down the final connecting ramp to the waiting aircraft and boards, but you hesitate to cross the threshold due to an intense fear of flying. Certain you will be able to ease your fears and take that final step, you tell the family to find their seats and you will join them shortly. After a period of 20 minutes or so passes, the cabin crew closes the aircraft door leaving you shut out of your flight. By faith, your family members trusted the airplane manufacturer, the airline, flight crews, pilot and so forth, to safely deliver them to their destination. All you needed to do was take that step of faith and step onto the airplane, but you did not. Everything was prepared and ready for you, all parties had done their jobs correctly and you were ready to go. The final remaining but necessary step was to complete your part by getting on board, but failed to do so. Just like this person who missed their flight because of their inaction to take the final step, anyone wishing to be saved from the fires of hell must consciously receive the promises of the Father through the shed blood of Jesus Christ. When Jesus died on the cross He paid the price for everyone’s sin, but to make it real you must make it personal. Let us look at another example to illustrate this vital point. You have contracted a lawyer to draw up your will to protect your loved ones when you die. Are the terms laid out in the will in force before you place your signature on the document? No. If you die before signing the will the terms and conditions are not enforceable and your family is left in a mess – your inaction has very real consequences. Absolutely, YES, God loves YOU! Isn’t it wonderful to know this? Our collective problem is that God does not “love” our sin, which is separate and distinct from Him loving “us”. You may perhaps be familiar with the phrase, “Love the sinner, hate the sin”. It is our sin addiction which keeps us from a personal, intimate, and loving relationship with our Creator. When Jesus Christ willingly sacrificed Himself upon the cross, He took upon His own body the entire sins of all humans, including yours. The Bible is absolutely clear that salvation is the free gift of God, which cannot be earned, it cannot be bought, and is available through no other name but Jesus. While you may feel lonely and unloved, God has already declared His perfect and unfailing love for you, His cherished and most precious creation. God’s Everlasting Kindness – God’s love is absolute and unending. God is Faithful in His Love for Us – Jesus came into the world with the message of free forgiveness (grace). Jesus died to Save Us from Sin – You may receive the free gift of eternal life simply by asking Jesus to forgive your sins. The stone that you builders rejected has now become the cornerstone. The Love of God brings Eternal Hope – All earthly hope in our money, health, employment, etc.. will ultimately fail; only the true hope of eternal life through Jesus Christ endures forever. “Yet what we suffer now is nothing compared to the glory he will reveal to us later. For all creation is waiting eagerly for that future day when God will reveal who his children really are. Against its will, all creation was subjected to God’s curse. But will eager hope, the creation looks forward to the day when it will join God’s children in glorious freedom from death and decay. Pray to God for peace, forgiveness and hope. If you are truly sorry for committing sins against Him, and freely and wholeheartedly repent, God’s Word declares He will hear you and extend free forgiveness. If you have Bible, why not pick it up and start reading, what can it hurt? Should you not have a Bible, make it priority to obtain one today, His Word will change your present and future life – guaranteed! Where is Your War Room? Last Sunday evening, my wife and myself saw the new movie, War Room, which I easily give a 10/10 for it’s adherence to solid biblical teaching and doctrine. Time and time again in scripture, we see the results of dedicated, persistent prayer. Friends, prayer is our best, and only effective weapon against this world, who is being overrun by the Prince of Darkness, Satan. As Bible-believing Christians, we need to be on our knees in fervent prayer each and every day, crying out to God for intercession and healing. Are you angry with your spouse? The real enemy is Satan. Are you jealous of your neighbour? The real enemy is Satan. Are you impatient? The real enemy is Satan. Are you selfish? The real enemy is Satan. Are you struggling with an addiction? The real enemy is Satan. Are you full of pride? The real enemy is Satan. Are you apt to hurt others by speaking sharp words? The real enemy is Satan. Pray with your whole heart. Pray, pray, pray. Pray with urgency – do it now! *Scripture quotations from the New Living Translation. I have a question for you. Are you a Christian? If the answer is yes, then are you living a full life for Jesus Christ as best you are able? When we come to Jesus in repentance and faith, Jesus says He wants all of us, not just part, but our entire being. The time for sitting on the sidelines is long past, what are you doing to share the Gospel in your community? Jesus Christ Himself commands us to GO!! God does not expect you to “do it all” yourself, there are millions of Christians alive today who are called to spread the Gospel. However it is true how God gives each person certain spiritual gift(s) upon receiving the Holy Spirit, we are to use for His glory, to share the Gospel Message of Jesus Christ with others. See 1 Corinthians 12. Everyone going out to preach the Gospel Message, needs to know clearly in their heart and mind precisely what the Gospel is, and equally important, what is it not. Carefully read the warnings from Paul again, letting it sink down into your soul. If you intentionally preach a distorted Gospel, God says you will be cursed – take Paul’s admonition seriously! a promise of wealth and prosperity. a guarantee of an easy, worry-free life. dependent upon the opinions of sinful man. to make us feel good about ourselves. to be altered to fit your personal opinion. a works-based message of salvation. an “all religions are equal” message. change the Gospel message in any way!!! think you are big and important. shift the focus and glory away from Jesus. water down, dilute, alter, massage, twist, or do anything to change the Message – There is only ONE GOSPEL! back down or shy away from preaching the truth, pray diligently for strength and guidance. say, infer, imply, or lead people to anything other than the cross, and the redemptive work of Jesus Christ. good news for everyone who hears, believes, and obeys. about the virgin birth, life, death, and resurrection of Jesus Christ. finding forgiveness, redemption, and a new life through Jesus. perfect, absolute, unchanging, non-negotiable, everlasting, eternal, holy, wonderful, and free! the message of salvation through Christ alone. our free “ticket” to heaven. the only way to avoid eternal damnation in hell. Now go! Be the hands of feet of our Lord, Jesus Christ. Using the abilities, gifts, and talents, God has given you, go unto all the world and share the Good News! Pray for guidance. Pray for instruction. Pray for strength. Pray for protection. Pray for the words to speak. Pray for humility. Above all else, pray. May God bless you! With all of the recent media coverage and public outrage over the killing of Cecil the lion I have a very simple question ask. Where are the public protests and media outcry over the millions of babies murdered at the hands of abortionists every year??? Nothing, zilch, zero. A society who devalues human life is totally and absolutely morally bankrupt. How much longer will God endure these wicked, daily abominations to His Holy Name? Woe to those who were perpetrated these heinous crimes against Almighty God, they will not escape the judgment of our LORD, JESUS CHRIST. Although the bible does not use the word, “abortion”, directly, it is abundantly clear that God places a very high value on human life. Every human being is formed inside the womb in His image, so there is absolutely no difference between a newly-formed fetus, and a baby just delivered. God is involved directly and personally in the conception, development, and growth of every human being. Folks, ABORTION = MURDER – those are the true facts, and says volumes about the moral state of our country and society. Do not be deluded into believing an unborn baby is not fully human, this is a lie of the devil. If God notices when a single sparrow dies, how much more does He notice when a helpless, innocent baby is killed? The eternal consequences to those who participate in, and support this “industry”, is not going to be very pretty. Contained within the pages of Genesis, is the true account of how our world became cursed by sin. It is here we are told Adam and Eve first sinned against Almighty God, and how the fate of all humanity was decided on that day, 6000 years ago. Although the story has a tragic beginning, the ending is simply amazing and wonderful!! God in His unending mercy, sent His Son, Jesus Christ to be sacrificed on the cross for our sin, so we may once again have true and everlasting fellowship with Father and Son. “Now the serpent was more crafty than any beast of the field which the LORD God had made. And he said to the woman, Indeed, has God said, You shall not eat from any tree of the garden? The woman said to the serpent, From the fruit of the tree which is in the middle of the garden, God has said, You shall not eat from it or touch it, or you will die. The serpent said to the woman, You surely will not die! For God knows that in the day you eat from it your eyes will be opened, and you will be like God, knowing good and evil. When the woman saw that the tree was good for food, and that it was a delight to the eyes, and that the tree was desirable to make one wise, she took from its fruit and ate; and she gave also to her husband with her, and he ate. Then the eyes of both of them were opened, and they knew that they were naked; and they sewed fig leaves together and made themselves loin coverings. They heard the sound of the LORD God walking in the garden in the cool of the day, and the man and his wife hid themselves from the presence of the LORD God among the trees of the garden. Then the LORD God called to the man, and said to him, Where are you? He said, I heard the sound of You in the garden, and I was afraid because I was naked; so I hid myself. And he said, Who told you that you were naked? Have you eaten from the tree of which I commanded you not to eat? The man said, The woman whom You gave to be with me, she gave me from the tree, and I ate. Then the LORD God said to the woman, What is this you have done? And the woman said, The serpent deceived me, and I ate. The LORD God said to the serpent. And to dust shall you return. God’s original plan was for Adam, Eve, and their descendants to live forever together with Him in the Garden of Eden, in a perfect, pristine, sin-free world for eternity. God exists outside of time and space, and knew in advance they would disobey Him when He said, “Then the LORD God took the man and put him into the garden of Eden to cultivate it and keep it. The LORD God commanded the man, saying, From any tree of the garden you may eat freely; but from the tree of the knowledge of good and evil you shall not eat, for in the day that you eat from it you will surely die.” Genesis 2:15-17, NASB. Did you get that? God said they would die if they ate from the forbidden tree, clearly implying they would live for ever if they obeyed! Well, the “serpent”, who represents Satan the Devil, a fallen angel who rebelled against God, knew God’s plan and decided to get Adam and Eve to disobey, thereby denying them the blessings of fellowship and eternal life God had promised. Weeds – thistles, thorns, etc..
All creation is decaying and suffering the effects of original sin. The root cause of every hurricane, earthquake, volcano, garden weed, and so forth, is caused by SIN. Our world is NOT what God intended to create, and is being destroyed by the lasting and corrosive effects of sin. In actual fact, this earth, our world, is terminally ill and cannot be saved. During the soon-coming future judgment of mankind, our “beautiful world” will be utterly, completely, and absolutely destroyed by fire, and it is our fault. As in the days of Noah we have done wickedly in the eyes of God, and judgment upon us will not be restrained forever. “They deliberately forget that God made the heavens by the word of his command, and he brought the earth out from the water and surrounded it with water. Then he used the water to destroy the ancient world with a mighty flood. And by the same word, the present heavens and earth have been stored up for fire. They re being kept for the day of judgment, when ungodly people will be destroyed. But you must not forget this one thing, dear friends: A day is like a thousand years to the Lord, and a thousand years is like a day. The Lord isn’t really being slow about his promise, as some people think. No, he is being patient for your sake. He does not want anyone to be destroyed, but wants everyone to repent. But the day of the Lord will come as unexpectedly as a thief. Then the heavens will pass away with a terrible noise, and the very elements themselves will disappear in fire, and the earth and everything on it will be found to deserve judgment. No amount of recycling efforts can truly clean up our world, it is beyond saving and ultimately temporal and worthless. While the Earth cannot be saved from judgment, YOU can be! You have one and only ONE choice, to repent of your sins and confess the name of Jesus Christ, asking for His forgiveness. Unless you willingly and freely do this with your whole heart, you will end up being tormented in hell for eternity. There you have it, the sad story of how sin gained entrance into our world, and what is in store for us. My hands are clean and my conscience is clear, I have told you the truth. What you do with this knowledge is up to you, please make the right choice; come to the feet of JESUS CHRIST today!! May God bless you. No matter if our worries are over finances, the health of a loved one, job security, and so on, worry, it is ultimately self-consuming and destructive. We can worry all we want, but nothing of substance will change, except to boost our anxiety and street levels. I have always struggled with worry and continue to do so, but am learning to let go of it more often. Matthew records basic instructions Jesus has for us on how to handle worry God’s way. Think upon this; if God is able to literally bring everything into existence with a thought, is he then unable to care for you? Think about. The Lord God Almighty Himself, wants to take our concerns and worry upon His shoulders, leaving Him free to bless and care for us. Worry has always been part of the fallen human condition, but increasingly, I believe is becoming a major problem in our society. This is quite a list! For certain I could add quite a few others worries, and I suspect you could as well. Satan thrives on our worries, he just loves them! Why? Because it takes the focus of our eyes off Jesus Christ, and we easily become wrapped up with our daily concerns, instead of trusting in, and relying upon the strength and promises of God. It is at this point where we slip of the rails, when we fail to make Jesus our #1 priority and love. For the redeemed of this world, none of these concerns and worries will matter at all in eternity, nobody will worry or lack for anything in heaven. So, if these distractions, which is what they are, will count for nothing in eternity, why should we dwell upon them now? I am serious, why do we waste time being stressed out by things which do not matter a bit? “That is why I tell you not to worry about everyday life – whether you have enough food and drink, or enough clothes to wear. Isn’t life more than food, and your body more than clothing? Look at the birds. They don’t plant or harvest or store food in the barns, for your heavenly Father feeds them. And aren’t you far more valuable to him than we are? Can all your worries add a single moment to your life? So how about it, will you try to worry a bit less, trusting rather in Jesus who wants to ease your burdens? No matter your circumstances, you can absolutely trust the name of Jesus Christ; there is no reason to be afraid. The God who created the universe stands ready to receive you into His family, will you accept the invitation? Get the answers you need – now! Why is my life so hard? What is the purpose to it all? Can I know for sure if God is real? Does anybody really love me? The currents of life are flowing so quickly you hardly have time to stop and catch your breath. Change is in the air, and most of it is not good. The very fabric of society is under relentless attack by demonic spiritual forces, which are trying the souls of men. What was once considered evil is now embraced, even worshipped. Absolute morality is considered a relic of the past, and has no anchor. If I am right, and you are right, and your neighbour is right, somebody then must be wrong, right…? After all, if 1+2=3, and 1+2=4, and 1+2=5, how can you be sure of anything? Thankfully, our God is always right, a light of hope in the darkness, a comforting companion on a long journey. God has never changed, it is not in His nature, otherwise, all of creation would collapse. God has faithfully recorded His word for us in the Bible and is the only and true source of truth, morality, and strength. Don’t be overly alarmed by the happenings of this world, for all things old are passing away, and yea, are nearly gone. Hold fast to our Lord Jesus Christ, our true anchor, sustainer, and author of our salvation, foe He changes not. How to be saved and know it!